There are a lot of social movements happening in our current day and age. People are working together to fight against oppression and injustice wherever it might be found. 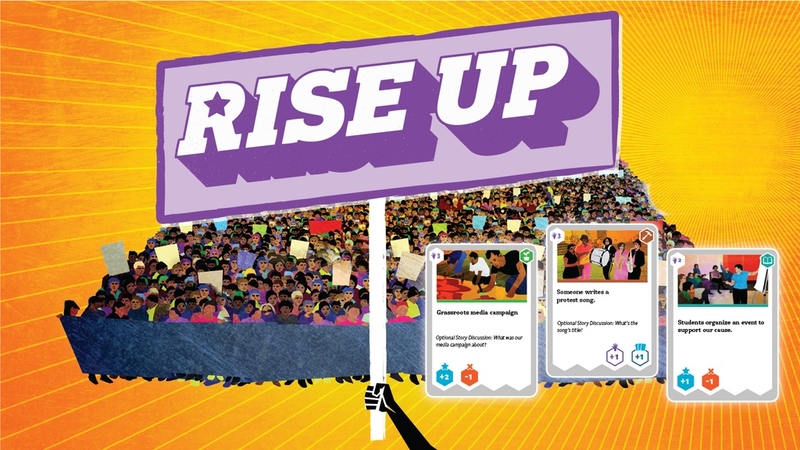 And now you can take your social movements from the streets to your tabletop with Rise Up, a new board game that's on Kickstarter. As one would expect, Rise Up is a cooperative board game. Players are looking to change the system and create a better world for you and me. They do this by gaining supporters, organizing events like marches or strikes, creating viral protest songs, and other such like that. However, the System that you're fighting against isn't just going to sit idly by. They'll engage in smear campaigns, cause you to lose supporters, and generally crack-down on your activities. Only through cunning strategy and teamwork will you be able to overcome. The Kickstarter campaign for the game is up and running now. They're not quite 1/3 of the way to their goal, but there's still 29 days left to go.